Why Running A Not-For-Profit Venture Has Given Me My Why...but why should you care? I guess the starting point here is to answer the question, What Is My Why? I'm a 69-year-old man who has stepped away from his original business because it was failing. I turned to a not-for-profit out of a passion for stories and am now building a platform, not just for other storytellers, but also for me. I'm a man who has been reading fiction from the age of four and writing for as long as I could hold a pencil. I am also a man who was growing up at a time when we could not talk at the table. I couldn't talk after work because my dad had just arrived back from a ten-hour shift at work. I couldn't talk at night because I shared a bedroom with my brother. I was always being told to shut up at school and at work, no one could hear me. Prepare: Practice: Posture: Perform. Well, I did all four and received a round of applause. That was the moment that I realised my desire was to talk, to stand in front of a live audience and deliver quality stories. Let's jump forward to 2017 when I was persuaded to create a storytelling event by a business owner who then left the UK to go onto a Shamanic retreat in South America-he is still there. One evening a month, in Leamington Spa, where I offer a stage for storytellers and authors to entertain a live audience with their true life and fictional tales. An evening where story lovers can sit back in a unique room, with a coffee/tea and piece of cake, to be entertained for two and a half hours. For the authors and storytellers, we offer the opportunity to sell their novels and practise their craft in a safe environment. We have been fortunate enough to attract at least two storytellers who have appeared at the Edinburgh Fringe and authors with multiple published novels. 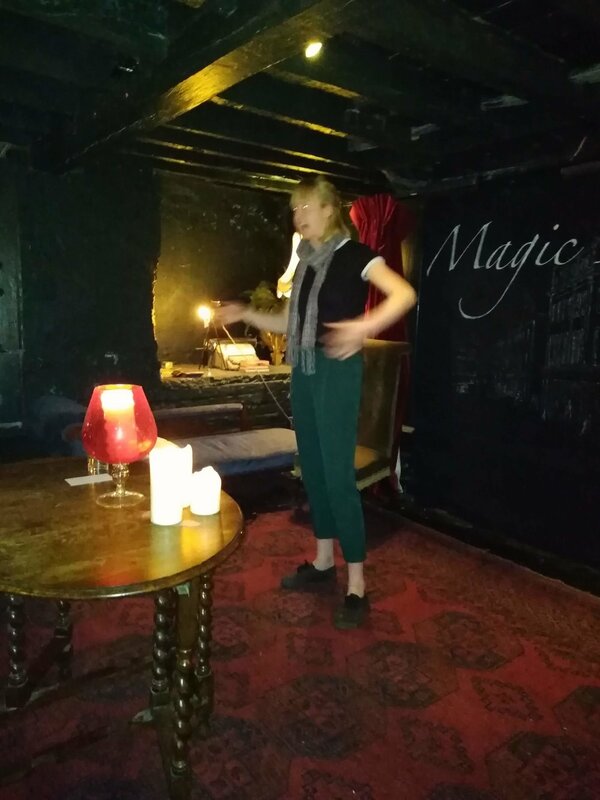 The opportunity to perform in the depths of a 17th-century candle-lit basement has been enough to attract them to the centre of the country from Newcastle, Liverpool, Gloucester and Wales. We are proud of the 'differences' we have worked at creating to distinguish ourselves from the 'normal' events, starting with the venue itself. This goes for our audience of art students from the University of Warwick, friends of the performers and theatre-goers looking for an evening with no loud music, shouting or fighting (unless called for in the script). The storytellers do not have to counter the noise and distractions from bars or libraries, as the norm. We feel this puts us head and shoulders above the competition. At £3 per person, we feel that we offer real value for money, all of which we donate to our Charity of Choice for the month. So far we have raised over £500 for a variety of charities ranging from supporting abused children to guide dogs. The venue is sponsored by Spa Computers and the staff of Temperance are all on board with the venture. So, if you are a charity and you would like to be part of our venture just contact me at ernie@erniesaid.info We will need a picture and a short personal bio and we will need you, or someone from your organisation to come along on the evening, with a banner and leaflets, to talk to us for ten minutes about the charity. Thank you, Ernie and team, for a lovely evening last night. The stories about walking in winter were both captivating and inspiring - would definitely recommend to anyone looking for an alternative and heart-warming way to spend an evening. Thank you for inviting me along to the night, it was great fun and I’ll tell my friends to come along. I’m sure I’ll come again, it was lovely to read in such a supportive atmosphere. If you are a storyteller or an author these are a few examples of Why you should care. And in my next post, I'll tell you Who You Are.